Source: CVS Health Enterprise Analytics, 2018. Cohort of commercial clients, Q2 2015-Q1 2018. Pharmacy benefit managers (PBMs), such as CVS Caremark, negotiate rebates on behalf of payors to help keep costs in control. Virtually all rebates are passed on to our clients, who in turn use them to make prescription drugs more affordable for their employees and plan members. Includes commercial members in health plans, employers, Medicaid, and exchange plans. It helps to understand how rebates work today and how they may be better used to make medications more affordable for consumers. Of the $1.2 billion CVS Health spends on employee benefits, $250 million is for prescription drugs. The 185,000 employees covered by the company’s benefit plan, like 45 percent of all commercially insured consumers in the country, are in a highdeductible health plan (HDHP) with a Health Savings Account. CVS Health uses rebates to help lower premiums and out-ofpocket (OOP) costs for our employees on the part of the benefit they use the most — prescription drug coverage. CVS Health offers first-dollar coverage — before the employee deductible is met — for many medications, including generics and those considered preventive for many chronic conditions. This has shown to improve adherence and lower overall costs in key disease categories including hypertension, hyperlipidemia, heart failure, diabetes, asthma/COPD, and depression. In our response to “American Patients First,” President Donald Trump’s blueprint to lower drug prices, we recommended immediate action to expand covered preventive products and services covered to include those intended to treat chronic diseases or allow them to be covered prior to the deductible being met for consumers in HDHPs. We also offer clients the option to pass on rebates to their members at the point of sale just as CVS Health does. About 10 million of the lives covered by our PBM are in plans that do the same. Whether applied at the point of sale or used to lower premiums, the rebates negotiated by PBMs are an important tool in helping combat rising launch and year-over-year drug prices set by manufacturers. Source: CVS Health Enterprise Analytics, 2018. Total projected health care cost savings from improved adherence per 100K commercially insured members. 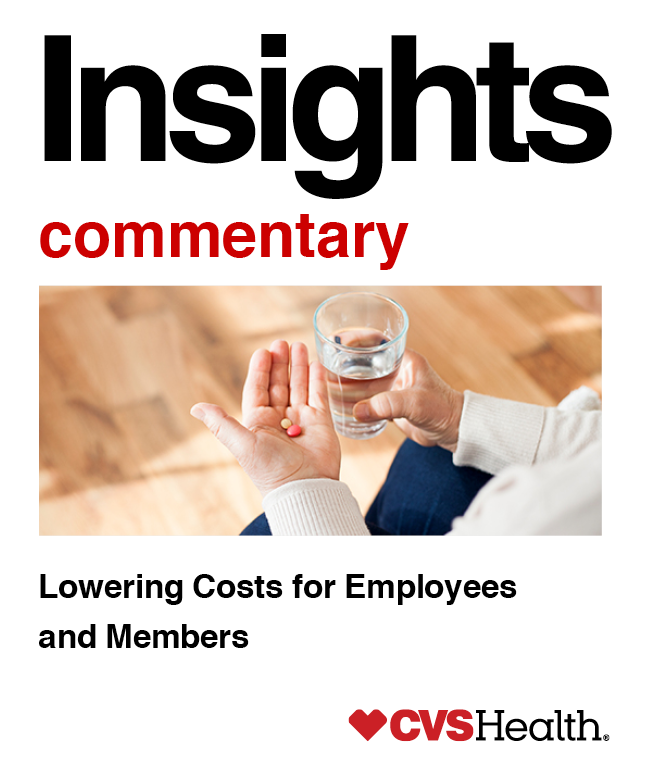 In addition, PBM innovations like zero-dollar preventive drug lists, helps CVS Health and the PBM clients we serve continue to offer an affordable prescription benefit and control costs effectively, while lowering OOP costs for plan members.